The latest from Sage Dynamics is a three part series covering Support Hand Only Handgun Skills. They had a lot of knowledge to impart on the subject, so you will find the next segment coming up soon in its own post. You have two hands. Nature, conditioning and experience have made you favor one over the other. A few of us (me included) couldn’t really make up our minds so we favor both. Some favor one hand for some tasks and one hand for others. When it comes to the operation of a firearm (specifically a handgun in this case), we ideally use both hands to operate the weapon in almost all circumstances. We want to train primary-hand-only skills as often as possible because the reality is that you may need or other hand for other tasks in the event of a use of force (opening or closing doors, guiding a loved one, etc). The average shooter doesn’t spend much time on primary-hand-only skills in my experience and a disproportionately high number have spent even less time training support-hand-only skills, or have never been trained to do so. 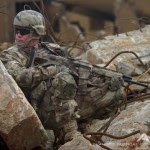 To be clear, your Primary Hand is the hand you grip and operate the trigger of your weapon with, your Support Hand provides your supporting grip and performs other tasks such as weapon light operation, reloading, etc. There are other terms to describe the two such as “Strong/Weak” or “Primary/Offhand” but they all mean the same thing. For ambidextrous shooters, your primary hand is the hand you prefer over the other to operate the weapon. We carry a holster and it’s going to be for one hand or the other. That is your primary hand. We choose (or nature chooses for us) our primary hand because it is the most implicitly comfortable and requires the least, or no, conscious thought on our part. We become dependent on it because we like to be comfortable and proficient and sometimes being forced to perform primary skills with our support hand makes us feel (and look) sloppy and inefficient. By all rights, if you don’t use your support hand, it will perform tasks in varying degrees of inefficiency. In our day to day lives, no big deal. Why learn to write left handed if you are right handed? Why suffer the aggravation of throwing right handed if you are left handed? These tasks normally have no sense of mortal urgency attached to them so we place little importance (or any) on learning to perform a skill with either hand. Well, its worst-case scenario time. You find yourself in a situation where your primary hand/or arm is disabled. In a self-defense situation there is a real possibility. Gunshot wounds, knife cuts/stabs and devastating blunt force trauma can render your arm or parts of it functionally useless. If this happens, you can either learn to use your support hand, or, well…Some might think this is a slight possibility, especially to those who only carry a firearm in a self-defense fashion and not by profession. Thought, the fact that you cant honestly call in an impossibility means that you need to practice these skills at least to a level of basic proficiency. 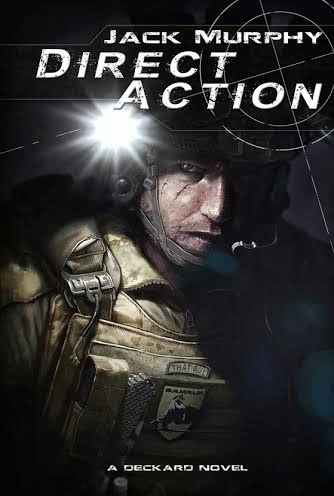 In any situation, never expect conditions to be ideal and having to operate your weapon one-handed with your support hand is about as less-than-ideal as you can get. If you suffer injury prior to drawing your weapon, the draw will have to be done with your support hand. Some shooters may get frustrated just thinking about it, though it isn’t as difficult as it sounds. It is going to be slower and require more manipulation than a primary hand draw and more difficult depending on the type of holster you carry in. We will look at Hip Carry, Inside the Waistband and Appendix. Hip holsters are the most prevalent holster out there, mainly thanks to law enforcement and military, of course they are just as common for the CCW shooter. 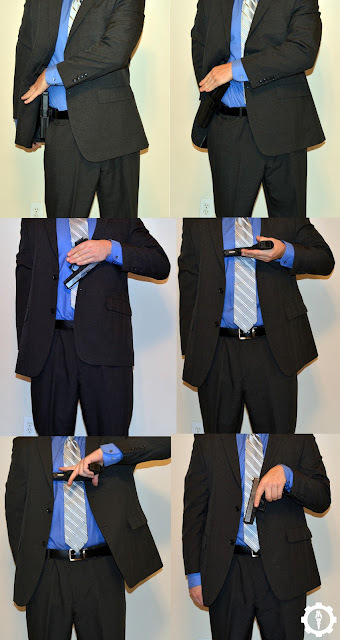 For the citizen who carries concealed, the mechanical steps of drawing from a hip holster with their support hand is going to be the same as from an exposed holster, only with the additional step of clearing the cover garment. IWB carry isn’t much different from hip carry, in fact it can be easier than hip based on the type of holster and its carry location. Appendix, while it does fall into the “IWB” category, stands alone due to its unique carry position. 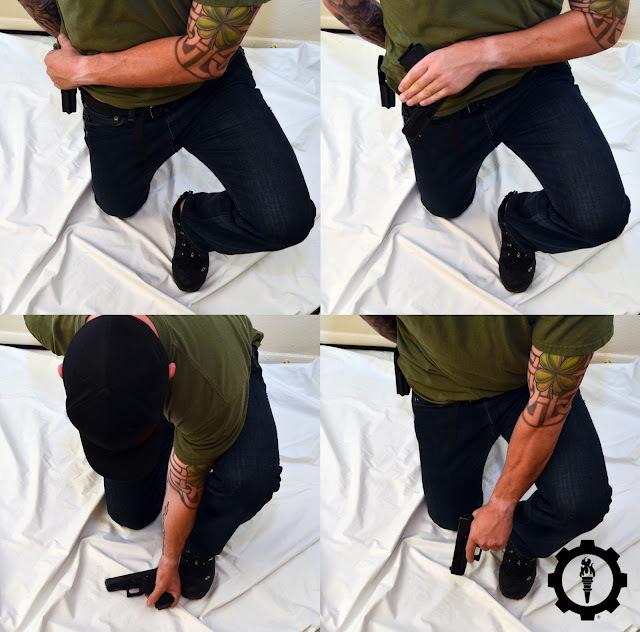 From any of the three general carry positions, there are one or principle draw techniques that can be used, however a problem often has more than one solution and I encourage you to explore alternate methods. I will cover one method for each carry position and two generic methods that work well for the three general carry positions. Because I almost exclusively carry OWB hip, the Cross Body is my preferred method of support hand draw. I favor it because it maintains weapon contact with the body through almost the entire process, though at the sacrifice of some speed when compared to other methods. If you have to sweep a cover garment, you can use an extended thumb to push up or push back and hook your remaining fingers underneath to grab the weapon using a whole hand pinch around the grip. To draw, pull straight up and then guide the handgun around the contour of your body to either the chest or midline stomach. Its important to make sure the weapon totally clears the holster before moving it around to your front to avoid the weapon binding in the holster. The handgun is held against the body (you can bend slightly backwards at the waist for additional support) and rolled against the chest to establish a shooting grip. Obviously cover should be used to complete this draw (and all draws) if possible. With this method, the cover garment is swept in the same fashion as with Cross Body and the weapon is gripped in the same fashion as well. 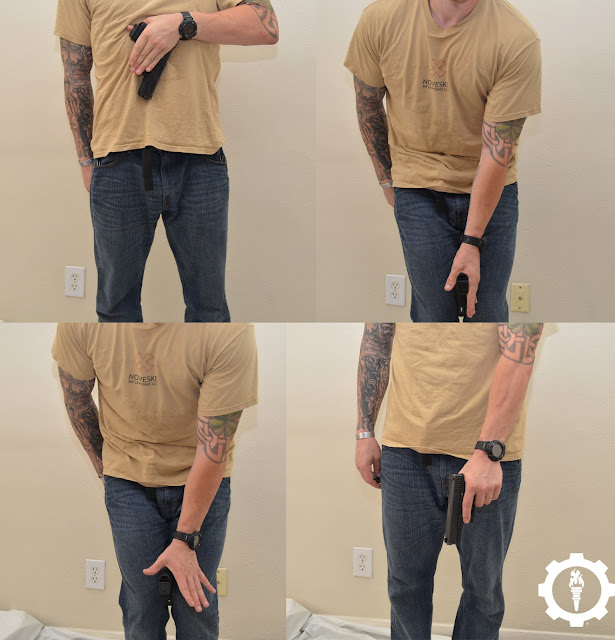 Instead of drawing the weapon around to the chest or midline, you pin it between your knees/upper thighs, release your grip and then establish a shooting grip. 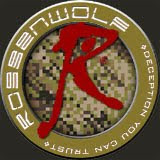 If cover is available, or sufficient concealment, use it. 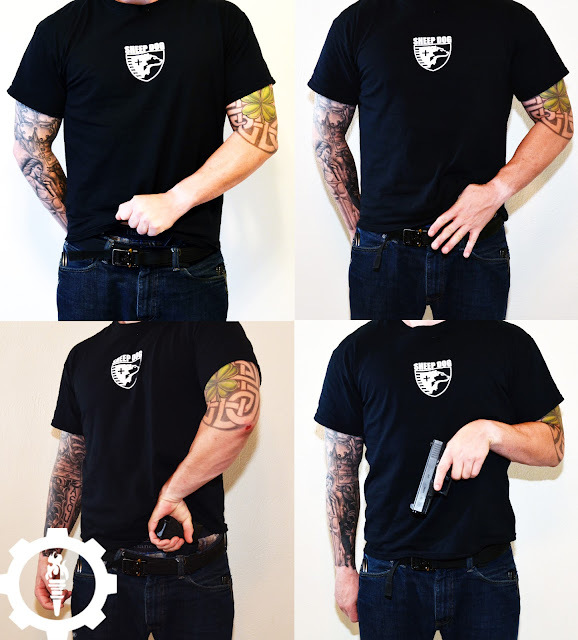 In a crouch, either a speed kneel or two knees down, the cover garment is cleared and the handgun is gripped using the whole hand (as with the other draw methods). The weapon is un-holstered, set on the ground and picked up in a proper shooting grip. You can also pin the weapon behind the knee to establish a shooting grip or pin it under your foot, terrain dependent. From a speed and access point of view, the support hand draw from appendix carry is probably the fastest method. Using the Cross body technique is a simple matter of pulling the weapon straight up, or an alternate method is to reverse your hand as you clear the cover garment and draw the weapon in a traditional fashion. If you carry in an Inside the Waistband holster behind the hip, you may be able (based on your flexibility) to simply reach behind you and draw the weapon with a traditional grip. Otherwise, you will have to rely on one of the methods already addressed. When considering the problem we are presented with, drawing with your support hand, there are multiple solutions to be discovered through practice. I have seen police officers (and CCW citizens) draw to the midline, tuck the weapon in their belt and establish a shooting grip from there. I also know a rather flexible officer who can reach behind his body and draw from a hip carried duty holster with a proper grip. Over the years I have seen quite a few ingenious methods (and a few questionable ones) that were unique to the specific shooter based on their body type, flexibility and holster/carry position. The most important part is to practice often and create as many methods as you can. Next week we will look at reloading with the support hand only.